Citation: Cusato D, “Intravitreal Injection of VEGF Inhibitors – Impact of Drug Containers”. ONdrugDelivery Magazine, Issue 94 (Jan 2019), pp 20-26. Table 1: Comparison of typical syringe packaging linked with intravitreal injections of anti-VEGF drugs. Of course, there are various advantages and disadvantages linked with each configuration, including aseptic assurance, preparation steps, administration time, packaging system intended use and overall cost of the packaged drug product. Essentially, the main driver for clinics and hospitals to use compounded Avastin in plastic general-use and insulin syringes is overall cost. A compounded Avastin injection costs an average of US$50-60 (£39-47) versus $1500 per dose for Lucentis.6 This has a significant impact on much of the healthcare system including health insurance reimbursements, patient out-of-pocket costs and overall financial liabilities for the clinics and hospitals.6 Additionally, considering there are numerous publications referencing the clinical performance of the two options and their comparability, it’s reasonable to understand why this is a common practice.7-8 In short, some view it as a safe, effective and cheaper option. Fill-finish for insulin syringes and needle quality. Syringe functional performance following storage. Sterility or container closure integrity (CCI) testing after ageing. Although the FDA guidance mentioned above certainly promotes a reduction in risks related to use of compounded syringe products for intravitreal injections, there are additional factors to consider. For example, during a recent anonymous survey related to PFS / primary container design and development, 30 industry engineers from the various leading pharmaceutical companies, PFS manufactures, and well-known design consultant agencies shed some light on some of the common challenges they had experienced. The results of this study can be found in Figure 1. Along with providing insight into the challenges linked with developing such devices, this data also provides useful feedback related to overall patient risks. Although challenges related to particulates, extractables and leachables, chemical compatibility and CCI of nominally designed syringe devices are well acknowledged, the most common development challenges are linked with overall product design, design robustness and impact of process capabilities / control plans. 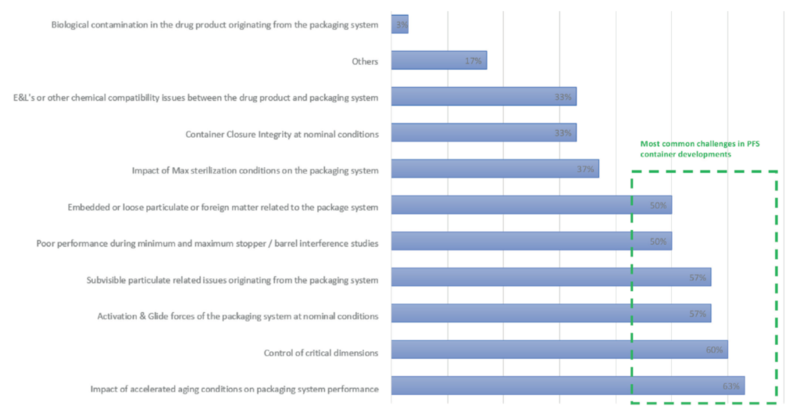 This is particularly interesting if you consider a gap analysis between the survey results and the contents in Appendix A of the FDA’s Industry Guidance, “Mixing, Diluting, or Repackaging Biological Products Outside the Scope of an Approved Biologics License Application”, versus the green highlighted section in the Figure 1 survey results graph. Figure 1: Survey results from 23 industry PFS R&D engineers. Another notable challenge is the drastic difference in supply chain management. Common practice for compounding pharmacies is to source sterile syringes from medical equipment distribution organisations. Such a supply chain inherently creates a more distant relationship between the owner of the final packaged drug product (e.g. compound pharmacy) and the design owner of the sterilised empty container (device supplier). This situation is completely different from the typical relationship within the traditional PFS industry, where device vendors and pharmaceutical companies essentially partner during most phases of the development process and continuously have transparent communications to ensure the product being manufactured is well characterised and the relationship between the device and the drug product are clearly understood. This also continues throughout the lifecycle of the drug. Change control processes represent a critical aspect of supply chain management. In the traditional PFS space, pharmaceutical companies are given access to a host of technical and proprietary information related to material and manufacturing processes under confidentiality agreements. Not only are these details directly linked with buy specifications and supply agreements, they are also included within drug master files (DMFs). The DMF allows for the FDA to sanity-check technical inputs related to the packaging supplier and components and cross-check them against the final packaged drug product description, labelling, etc. All this effort provides the foundation for a robust supply chain, that is well structured to manage the unavoidable changes that occur during lifecycle of a drug product. Although not specifically related to intravitreal injection, a nonetheless relevant example of the challenges that can be created with the compound pharmacy supply chain model for syringes occurred in 2015. In the summer of 2015, the FDA published multiple warning letters that specifically identified risks linked with compounded or repackaged drug products in general-use syringes that were being utilised as both a drug storage and delivery device. Overall, this included a considerable number of different sized general-use syringes (1, 10, 20 and 30 mL) and the focus was mostly on various products on the FDA drug shortage list including fentanyl, rocuronium, neostigmine, morphine, midazolam, methadone, atropine, hydromorphone, cisatracurium and remifentanil.23 According to reports related to this circumstance, risk of potency loss was linked with any syringe stored for more than 24hrs,24 which is a far shorter duration than some compounded drug products experience in syringes. With a traditional PFS drug product, such a scenario should be impossible as the primary packaging components are approved by regulatory bodies as essentially a constituent of the drug product and are very much treated with the same level of scrutiny as, for example, excipients within the formulation. Any significant modification of the manufacturing process or change to the raw materials utilised to produce these packaging components is considered a significant change. When a component does need to be changed, a situation that certainly arises within industry, pharmaceutical companies steer towards the conservative side and implement formal change control processes including new drug compatibility, extractables and leachables and toxicology assessments, product functional studies and ageing studies, to ensure the change in the device still supports a safe and effective product for the end patients. Needle-point contamination during re-assembly of the rigid plastic needleshield. During the compounding process with insulin syringes, various techniques are utilised including withdrawing the drug product from the originally packaged vial. Some pharmacies use a technique in which multiple doses are withdrawn from the vial using a general use Luer lock syringe, followed by the insulin syringe needles being inserted into the Luer cone and a final dosage being drawn up within the insulin syringe.25 With regards to the second concept, insulin syringes are clearly not designed to be insert into a Luer cone. Even highly skilled operators could struggle with such a manual process and thus repeatability is a major concern. If the needle is damaged via colliding with the Luer cone during this process and not detected prior to use, patients could experience a significant increase in pain perception or even more extensive damage to the eye itself. Following either of the filing techniques for insulin syringes mentioned above, the protective rigid needleshield is reassembled over the needle and onto the syringe hub. With regards to the manual re-assembly process, the main challenge experienced by common syringe users (e.g. insulin dependent diabetics, nurses, doctors, etc.) is that continuously aligning the cap over the syringe needle takes a set of steady hands, good visibility and high level of attention. This could have significant risks linked with transfer of bloodborne pathogens. The other concern is that if the plastic cap collides with the needle tip, it could damage the point. Again, if not detected prior to use, the results could be similar to those mentioned for the needle colliding with the Luer cone – pain or damage to the eye. With regards to development structure, it clearly makes sense to treat compounded products in any syringe that is both a storage and drug delivery device as a traditional PFS. As such, there are various things to consider including development team structures and expertise and design controls. PFS development project teams are normally composed of leading experts in product design, statistics, usability, regulatory, design control and manufacturing technology. Such skilled individuals working towards a common goal leads to a robust product, built on a solid foundation of data that focuses on critical regulatory inputs and most importantly the needs of the user and patient. It is quite feasible that these skill sets could create a significant financial burden for the smaller compounding pharmacy to absorb. Thus, another option is for such organisations to outsource this to device development firms or the suppliers of the devices. Some of the advantages to leveraging the expertise of the supplier is that compound pharmacies will create an improved supplier relationship and gain accessibility to components and tools to support a more robust development. For example, suppliers can provide min/max challenge devices (size, sterilisation, silicone, etc) to support product characterisation and ensure a clearly defined design space is realised. PFS development projects are commonly resourced to support the evaluation of tens-of-thousands of assembled devices with quality requirements that are linked with ppm-level defect rates in order to demonstrate appropriate process controls. This is clearly an area for improvement with regards to compounded syringes, as today it is far more common that all testing takes place using a limited sample of commercial production products. Such practices don’t necessarily capture batch-to-batch variation. Also related to the actual development process, it has become an industry standard and required by CFR 820 for organisations to host formal design reviews for drug delivery device development efforts. Such reviews intentionally include leading experts that thoroughly review design inputs, product requirements and supporting data, to ensure the PFS / drug delivery device product is a robust and safe solution for end users and patients. Within CFR 820, the following can be referenced regarding design reviews: “Each manufacturer shall establish and maintain procedures to ensure that formal documented reviews of the design results are planned and conducted at appropriate stages of the device’s design development. The procedures shall ensure that participants at each design review include representatives of all functions concerned with the design stage being reviewed and an individual(s) who does not have direct responsibility for the design stage being reviewed, as well as any specialists needed. The results of a design review, including identification of the design, the date, and the individual(s) performing the review, shall be documented in the design history file (DHF)”.21 It seems practical to assume resources from device companies or external consultant firms could support such design reviews as a subject matter expert. By hosting such reviews, compound pharmacy organisations would ensure they have formal industry expertise reviewing the product for overall robustness and safety. Supplier management relationship efforts can support improved product quality and end-user risk reduction related to compounded products in syringes via multiple mechanisms. As mentioned above, change control agreements could be integrated to support the specific needs of compound pharmacies. Of course, this concept will cost more time and resources and ultimately will create discussions related to overall product sales price. However, such concepts are supported by phrases such as “total cost of ownership”. Within such models, paying more for a robust drug delivery system, certainly outweighs the impact linked with a major market recall or, even worse, injury to end users. Additionally, documentation utilised by the PFS industry including, for example, technical files and DMFs, could be referenced by compound pharmacies to ensure the container systems are well defined. This would inherently limit the potential for changes to be made to the container system without prior notification. Table 2: Premium rubber composition. Most of leading vendors within industry have such offerings within their product portfolio but it’s not common practice for these to be utilised within general-use plastic syringe systems, which tend to use conventional / legacy materials. 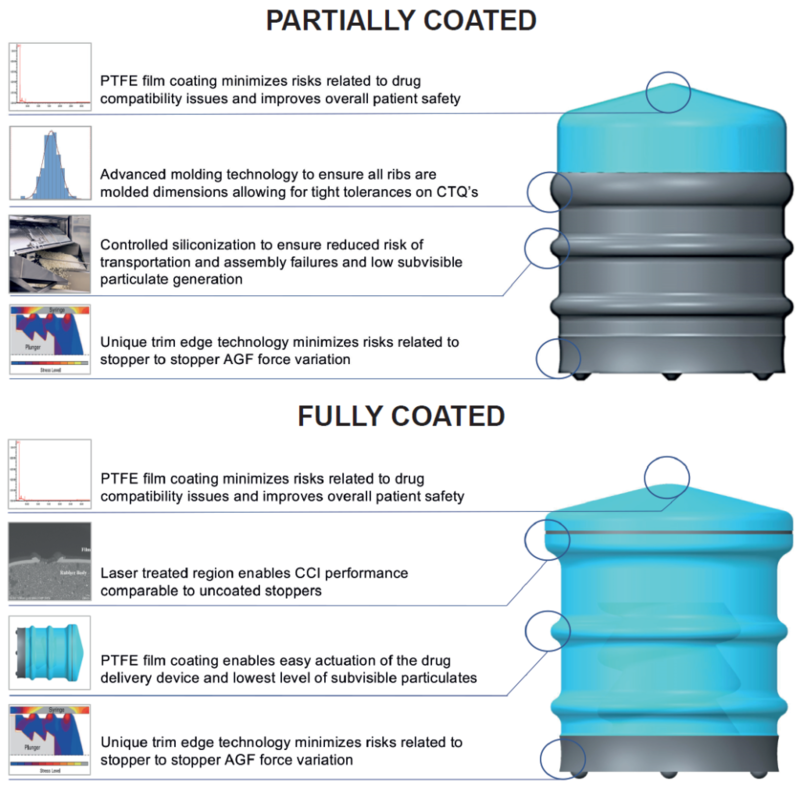 The coating of advanced plungers provides an additional source of risk reduction for improved patient safety and overall improved drug product quality via better drug compatibility, reduction in extractables and leachables. Advanced plungers can also enable silicone-free primary packaging, contributing directly to a reduction in silicone-related subvisible particles (SbVPs). Silicone-related SbVPs have been identified as a source of “floaters” experienced by ophthalmic patients following intravitreal injection. Additionally, the overall design of premium-coated stoppers supports a reduction in activation and glide forces (AGF) compared with legacy components. Figure 2 shows examples of commercially available partially and fully coated stoppers. Figure 2: Partially coated and fully coated plungers. Next-generation siliconised syringe options are offered by multiple vendors. They offer a variety of sizes and configurations including both Luer lock and staked-needle designs. These syringes are offered in plastic and glass materials and the siliconisation technologies utilised during the manufacturing of these products supports reduction of risk related to silicone SbVPs. Based simply upon surface area, siliconisation in the syringe barrel has a far greater impact on silicone-related SBvPs particulates compared with rubber. However, both provide opportunities for risk reduction. 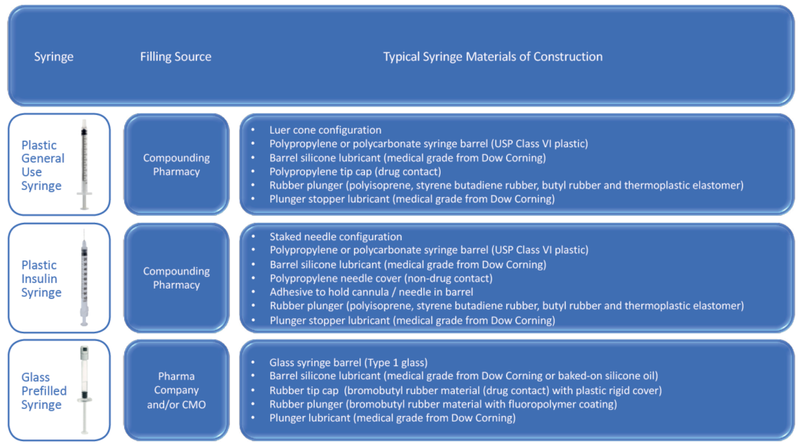 For siliconised syringes, the silicone is a critical feature of the syringe and supports the assembly of the stopper into the barrel after filling and the actuation forces of the syringe, although other syringe features also play a role such as inner diameter of the needle itself and viscosity of the drug product. A selection of example advanced PFS systems are described in Box 1. The TopPac® line from Schott is one of the most successful plastic PFS offerings on the market today.30, 31 According to public company information, the TopPac cyclic-olefin copolymer (COC) syringe product is injection moulded, which enables significantly improved dimensional tolerances over glass. The tighter dimensional tolerances along with Schott’s crosslinked siliconisation process provide consistent glide forces, resulting in precise and smooth drug delivery. The crosslinked siliconisation process is applied after the moulding step and cooling phase. A reactive silicone is applied to the internal surface of the syringe system followed by a curing process. The process is designed to ensure consistent distribution of silicone throughout the syringe barrel along with extremely low levels of free silicone oil. One challenge linked with most of the innovative technologies mentioned in Box 1 that significantly limits their use in compounding pharmacy setting includes the syringe products’ final configuration and packaging. Unlike general-use and insulin syringes, the technologies mentioned above are delivered with the stopper and plunger unassembled from the syringe barrel. Thus not only is filling required but assembly is required as well. Unfortunately, without proper fill-finish equipment, safe and effective filling and assembly of such syringe would be extremely challenging. An advantage to using the nested syringes is that they are not filled via the needle end of the syringe. This avoids the need to manipulate or reassemble the syringe during the filling process, and inherently reduces risks linked with reassembly of the rigid cap onto the syringe. 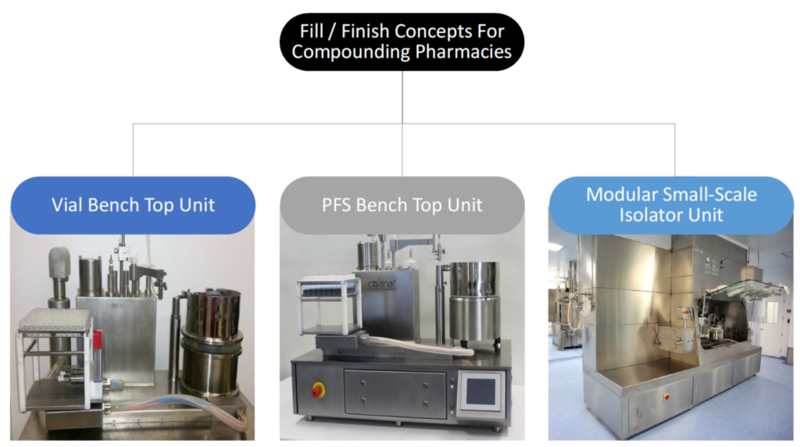 As final packaging linked with all the technologies on Box 1 are configured to support fill-finish operations such as Isolator technologies, a barrier limiting their usage by compounding pharmacies is proper fill-finish equipment. Historically, such fill-finish equipment has been designed for volumes in the billions of units.35 Additionally, as mentioned in the previous section, compounders have become very comfortable with manual operations under a hood with laminar flow. However, in recent years, several leading fill-finish suppliers have begun to develop and launch unique modular technologies that are suitable for clinical- and small production-volume filling. Additionally, most of this equipment is being designed to support the filing of multiple packaging configurations via the modular unit concept and simple change parts. This provides a means for compounding pharmacies to leverage the efficiencies compared with manual filing, and ultimately support return on investment in the cost of the sophisticated fill-finish equipment. Various organisations are working to support compounding pharmacies with proper fill-finish equipment, for example, AST Technologies with their GENiSYS® c20 isolator, and Colanar Inc.
During a recent discussion, Colanar President Bernd Stroeter explained that “503B compounding pharmacies have been converting from manual vial filling operations to benchtop vial filling machines in recent years. These benchtop filling machines are particularly suited as the first automated filling equipment due to a number of advantages, from their compact design and high build quality to their reasonable cost and ease of use. Further advantages are their flexibility to process vials, PFS and cartridges on the same machine, and their ability to be used in laminar flow workbenches, RABS enclosures, and isolators. Since the pharma industry is rapidly moving towards isolator technology, compounding pharmacies will also have to adopt this technology and acquire additional technical know-how in order to be able to operate this increasingly complex equipment”. Colanar has supplied various benchtop vial filling systems that can be incorporated into hoods with laminar follow, which seems to be the comfort zone for many organisations. Additionally, there is growing interest for further vial filling machines, and companies like Colonar Inc are now starting to get requests for syringe filling machines. Illustrations of Colonar’s various platforms to support compounding vial and syringe fill-finish operations can be found in Figure 3. Overall, intravitreal injections of VEGF inhibitors continue to be a growing trend within industry. As regulatory guidance continue to provide clarity and compounders capture the value from premium packaging systems, the robustness and safety of the compounded products will continue to improve. In the meantime, it is critical that industry communicates on the challenges and ideally establishes best practices regarding fill-finish process and equipment, packaging system selections, and testing structures, to ensure proper syringe system functionality and overall compounded product safety. It also makes sense for compounders and device suppliers to improve partnerships, as pharma and PFS device suppliers have done with considerable effectiveness. Compounders will continue to fill and sell compounded drug products in general-use and insulin syringes, so a transparent relationship is needed to ensure the safety of the device is was established and maintained throughout the lifecycle of the commercial relationship. All this certainly requires time, resources, effort and, more than likely, investment too, but the level of risk reduction that these practices bring to the overall situation is priceless. Brand CS, “Management of retinal vascular diseases: a patient-centric approach”. Eye, 2012, Vol 26 (Suppl 2), S1–S16. Palmer JM, Amoaku WM, Kamali F, “Quality of bevacizumab compounded for intravitreal administration”. 2013, Vol 27(9), pp 1090–1097. “BD Plastipak syringes without needles and BD General Syringes without needle, sterile, single use, latex free”. Becton Dickinson, Technical Data Sheet, 2016. Baker-Schena L, “In this era of anti-VEGF drugs, ophthalmologists must perform a tricky balancing act, managing financial realities even as they strive to provide optimal patient care.” Eyenet Magazine, June 2017, pp 39–44. Subramanian ML et al, “Bevacizumab vs ranibizumab for age-related macular degeneration: early results of a prospective double-masked, randomized clinical trial”. Am J Ophthalmol, 2009, Vol 148(6), pp 875–882. Subramanian ML et al, “Bevacizumab vs ranibizumab for age-related macular degeneration: 1-year outcomes of a prospective, double-masked randomised clinical trial”. Eye, 2010, Vol 24(11) 1708–1715. Bakri SJ, Ekdawi NS, “Intravitreal Silicone Oil Droplets after intravitreal drug injections”. Retina, 2008, Vol 28(7), pp 996–1001. Freund KB, Laud K, Eandi CM, Spaide RF, “Silicone oil droplets following intravitreal injection. Retina, 2006, Vol 26, pp 701–703. Yu JH et al, “Silicone oil droplets following intravitreal bevacizumab injections”. Am J Ophthalmol Case Reports, 2018, Vol 10, pp 142–144. Kinker B, Tewari A, “Intravitreal Silicone Oil Droplets after Multiple Avastin Injections”. JOJ Ophthalmol, 2017, 2(3), 555588. Scott IU, et al, “SCORE Study Report 7: Incidence of Intravitreal Silicone Oil Droplets Associated With Staked-on Versus Luer Cone Syringe Design”. Am J Ophthalmol, 2009, 148(5), pp 725–732. KocaKora MS, Ozbilen KT, Serefoglu K, “Intravitreal silicone oil droplets following pegaptanib injection”. Acta Opthalmologica, 2010, 88(2), e44–45. Schargus M, Werner BP, Geerling G, Winter G, “Contamination of Anti-VEGF Drugs for Intravitreal Injection: How do Repackaging and Newly Developed Syringes Affect the Amount of Silicone Oil Droplets and Protein Aggregates?”, Retina, 2018, Vol 38(10), pp 2088–2095. Liu L, “Silicone oil microdroplets and protein aggregates in repackaged bevacizumab and ranibizumab: effects of long-term storage and product mishandling” Retina, 2011, 52(2), pp 1023–1034. Palmer JM, “Quality of bevacizumab compounded for intravitreal administration”. Eye, 2013, 27(9), pp 1090–1097. Kahook MY et al, “High-molecular-weight aggregates in repackaged bevacizumab”. Retina, 2010, Vol 30(6), pp 887–892. FDA, Code of Federal Regulations, 2018, Vol 8, Title 21 Subpart C, “Design Controls”. FDA, “Mixing, Diluting, or Repackaging Biological Products Outside the Scope of an Approved Biologics License Application Guidance for Industry”. January 2018. Thompson C, “No syringe is approved as a standalone storage container, FDA says”. Am J Health-System Pharm, 2015, Vol 72(21), pp 1831–1832. Rodgers B, Waddell WH, Solis S, Klingensmith W, “Rubber Compounding” 2004. Depaz RA et al, “Technology That Reduces Subvisible Particles and Maintains Compatibility with Biologics”. J Pharm Sci, 2014, Vol 103(5), 1384-1393. Sakashita Y. “Initial Report of Micro-Projection Silicone-Oil Free Plunger Stopper (Micro-Projection Plunger Stopper, MP-PS_SOF) That Has Developed New Technology Based on Conventional Full-Laminated Plunger Stopper”. PDA Universe of Prefilled Syringes & Injection Devices Conference, Orlando, FL, US, October 2018. Yoshino K et al, “Functional Evaluation and Characterization of a Newly Developed Silicone Oil-Free Prefillable Syringe System”. J Pharm Sci, 2014, Vol 103(5), pp 1520-1528. “Prefilled Syringe Market Forecast 2015-2025”. Visiongain report, 2015. Gladd T, “Boehringer Ingelheim Revolutionizes Filling Line Flexibility”. Pharm Online, February 2015.